Solstice Bali Inflatable Stand Up Paddle Board. 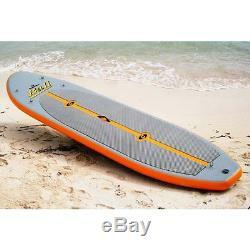 The Solstice Bali Inflatable Stand Up Paddle Board is a sleek, dependable ride that comes in flashy orange and grey. It's just as strong and rigid as any other board, but due to its revolutionary inflatable design, the Solstice Bali is far lighter and easier to carry. Made from durable 1000-denier 3-ply PVC reinforced fabric, you won't have to worry about punctures when pushing the board to its limits paddling through waves. This paddleboard is build to last! And it also comes with a carrying bag so you can fold it away for easy storage and a pump with gauge so you can air up your ride quickly and get right to the action! The Solstice Bali Inflatable Stand Up Paddle Board measures 128 inches long and includes four stainless tie-downs for securing your gear. Made from durable 1000-denier 3-ply PVC reinforced fabric. Incredibly rigid when fully inflated. Includes carry bag, pump, gauge, and stainless tie-downs. Overall dimensions: 128 inches long or 10'8. We are proud of our customer service and of our feedback! The item "SwimLine Solstice Bali Light Weight Inflatable Stand Up iSUP Paddleboard 35128" is in sale since Saturday, March 14, 2015. This item is in the category "Sporting Goods\Water Sports\Stand Up Paddleboarding\Stand Up Paddleboards". The seller is "ohyasales" and is located in Oklahoma City, Oklahoma. This item can be shipped to United States.